In a highly innovative General Budget for 2005-06, the Union Finance Minister provided a slew of concessions for the salaried class, women and senior citizens and proposed fresh tax brackets of 10, 20 and 30 per cent ranging from an income level of Rs 1.5 lakh to Rs 2.5 lakh and above. Will the new tax proposals earn revenue for the government? Describing the Union Budget as a Budget of a “lawyer” and not a “leader”, the main Opposition party, the BJP, today said the Budget presented by Finance Minister P. Chidambaram was “short on candour and high on dissemination”. Mr Chidambaram deserves all the credit...The Budget will live up to meet challenges of the time. A day after the fractured mandate in Bihar and Jharkhand the numbers’ game has been set in motion in Jharkhand where both UPA and the NDA have staked their claim for the formation of the government. The Supreme Court today sought to know the stand of Union Government on the “legal competence” of the Punjab Government to enact a law, terminating all water accords with neighbouring states after the apex court’s order last year asking the Centre to complete the Satluj Yamuna Link (SYL) canal. The Supreme Court today admitted a petition against Punjab Chief Minister Amarinder Singh, challenging his election to state Assembly from Patiala in 2002 on the ground of alleged corrupt practices and obtaining the services of two senior officers to ensure his victory. Goa's Governor S.C. Jamir tonight appointed Fransisco Sardinha as pro tem Speaker when the Assembly decides on Chief Minister Pratapsinh Rane's trust vote. 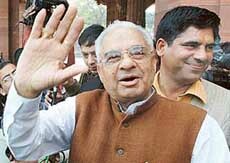 Is Mr Bhajan Lal all set to be elected leader of the Haryana Congress Legislature Party (CLP) at its meeting in the presence of party observers here tomorrow?